A specially-trained Perdue Heating & Cooling Comfort and Indoor Air Quality Consultant will visit your home and - using advanced diagnostic instruments and testing procedures - will identify problems that affect your indoor living environment. Your Perdue Heating & Cooling consultant will then provide you with a personalized plan to solve these problems, permanently. Your checkup starts with an information interview to learn about your current situation. Your input provides valuable information, such as whether any rooms feel clammy when the air conditioner is running, or if any parts of the house need to be dusted more often than others. We encourage all the adults in your home to participate in this initial consultation since everyone's perception of comfort and indoor air quality is unique. The inspection begins with your heating and cooling equipment. Your Perdue Heating & Cooling consultant will visually inspect your equipment for any signs of deterioration, improper installation, or insufficient maintenance. He or she will let you know the average life span of your existing equipment. Your Perdue Heating & Cooling consultant will also evaluate your system's air filtration and purification efficiency, to determine if improvements would better clean your indoor air. Even the best heating and cooling system will have trouble keeping you comfortable or will cost more to run if you don't have enough insulation. Your Perdue Heating & Cooling consultant will visually inspect insulation levels throughout your home and determine if they meet currently recommended levels. More importantly, he or she will look for hidden defects, such as hollow wall cavities, that allow air and heat to bypass your insulation. Attic ventilation levels will also be checked. To measure a home's air-tightness, Department of Energy scientists at Princeton University invented the blower door instrument. It is often featured in magazines and on television, including National Geographic, Better Homes and Gardens, Popular Science, and This Old House. 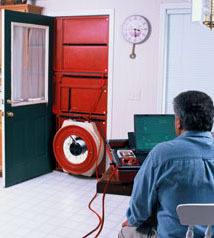 Using an Infiltrometer (a computerized blower door system), your Perdue Heating & Cooling consultant will evaluate how leaky or airtight your entire home is, and where improvements can be made. Not all air leaks are created equal. From an air quality standpoint, those around your windows and doors are good leaks, since they let in fresh outdoor air. Bad leaks let in dusty, moldy or polluted air from your attic, garage, or crawl space. Leaky air ducts often bring in dirty air, and cause your heating and cooling equipment to perform well below peak efficiency. As part of the Infiltrometer blower door test, your Perdue Heating & Cooling consultant will pinpoint where your home's worst air leaks are, and where improvements can be made. If your air duct system has hidden design flaws or blockages, your air flow will be restricted or unevenly distributed. This wastes your money and can make your home uncomfortable. Studies conducted for electric utilities nationwide show that more than 66% of heat pumps and air conditioners suffer from air flow problems. Your Perdue Heating & Cooling consultant will conduct "static pressure" tests - like a blood pressure check for your ducts - to reveal any hidden blockages or design problems. Do you have rooms that are hard to heat or cool? There are economical solutions. Your Perdue Heating & Cooling consultant will use an air flow capture hood to measure precisely how much conditioned air is getting to those rooms (provided the supply vents are accessible). If air flow is low, the causes will be determined, and appropriate solutions will be prescribed. Once the inspection and testing are complete, your consultant will explain the results, and give you a prioritized plan of recommended improvements. Many - such as adding insulation or weather-stripping - can be performed by homeowners as weekend projects. Other improvements may require professionals. Perdue Heating & Cooling has licensed, bonded and insured professionals that can handle any of this work for you. This way you have one company to hold responsible for all the work and any warranties that are available on that work.